So you’re here for the Bestmixer.io review? Or maybe just hunting for a Bitcoin mixer in general? Either way, this piece fits both the needs. Throughout this piece, I’ll dissect BestMixer to the core and share its features transparently with you folks. 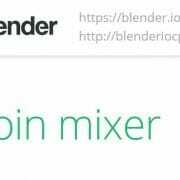 Note that nowhere in this piece will I mention Bestmixer being the best, or a better mixer than others, rather this is just a hands-on review of the platform, how it fairs with other mixers is for you to decide after you go through our other Bitcoin mixer reviews. Anonymity: How Anonymous the Mixer is regarding personal details and losing the Bitcoin Blockchain trail. Fee: Any mixer which is too expensive won’t probably be a good choice. Logs: We check if it keeps logs, which is okay for support purposes but if it does then for how long. User-interface: How easy or hard it is to use the mixer. Additional Addresses: How many additional addresses you can send the clean coins to per mix. Percentage distribution: If users get the option of manually choosing which Address gets how much of their total clean coins. Time-delays: How long the mixer waits before sending clean coins to the users, also the amount of control users get while deciding this delay. The above points do establish the fact that this Bestmixer review and all of our other Mixer reviews are extensively detailed and transparent, aren’t they? Let’s get started! 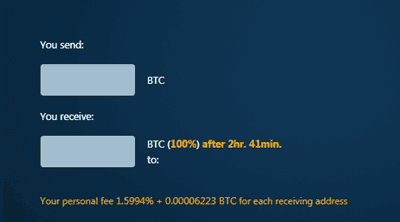 Deposit Percentage control for different address: Yes, User Controlled. How Hard or Easy is it using Bestmixer? Features, abilities and everything else only matters if the interface is easy enough for most people to understand and use without a lot of hassle; Best Mixer does keep that mind. As is evident, everything is self-explanatory and users only need to enter their output address manually, everything else is either automated or is customizable using the provided sliders. Even complete newbies can mix their Bitcoins simply by entering an output address and clicking on continue as everything else is optional and doesn’t need to be altered for a basic mixing process to go through. Then it even has a “Mixing strength indicator” which lets users increase the security of their mix if they wish to which is not a feature I’ve seen with many mixers out there. 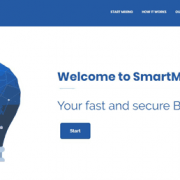 It also has included a “fee calculator” which lets you enter the amount of coins you send and displays the amount you’ll receive which provides complete transparency and information about the transaction to users before they actually send in any coins. Adding Address is as easy as simply clicking on the “Add Address” button, changing fee and percentage distribution too is extremely simple and can be done simply by moving the sliders left (for less) or right (for more)! In a nutshell, it’s easy to use, and provides complete transparency regarding fee and the chance to increase security pre-mix so I’d totally rate the UI a 5/5 without second thoughts for this Bestmixer.io review. How many Additional Addresses does it Allow pre Mix? Additional Addresses mean the number of extra addresses you can add to a mix so the coins for each mix aren’t sent out to one single address, and rather are sent in parts to all those addresses. This provides another layer of security and anonymity to your coins and further de-links your unclean coins from the cleaner ones you receive from the mixer. Bestmixer allows as many as 10 additional addresses for each mix, users need to click on the “Add Address” button right next to the output address box in order to add more addresses. Does it allow Manual Percentage Distribution? There are quite a few mixers which allow for additional addresses, but not many provide control when it comes to deciding which address will receive what % of your total funds. Fortunately, Bestmixer does. Users can use the sliders provided on the mixing page to increase or decrease the % for each address. It’s easy considering how there’s no manual calculations or input required but only requires slider-adjustment. Also, the addresses are color-coded and the slider for each address is of the same color making it easy to change the distribution for each address individually. Time-delays are a crucial part when it comes to anonymity considering how if the input and output times for the unclean and clean coins respectively is exactly the same it may look suspicious to some. Again, not all mixers provide control to users while deciding when exactly then want the coins to be sent out and rather send it out either instantly, or at random times. BestMixer has been a lot more considerate does support time-delays. It provides extreme control not just over the time-delay in general, but for time-delays for each specific address. 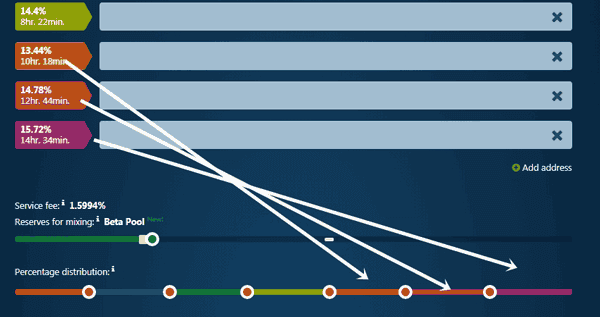 Hence users get to set different time-delays for each individual address which would further increase their anonymity. These delays too can be set or changed using sliders, again no manual input required except sliding the sliders where each slider-color denotes time-delay for addresses with the same color. What are its Three Coin Pools? Bestmixer is probably the only Mixer which has more than one coin pools and lets users decide which pool they wish to use, the pools also effect the fee of the mix and hence before we get on with the Bestmixer review it’s important we explain what these pools are. Pools here indicates simply three different sets of reserves and the only difference between them is based on where they’re acquired from. BestMixer has three pools, namely Alpha, Beta and Gamma Pool. 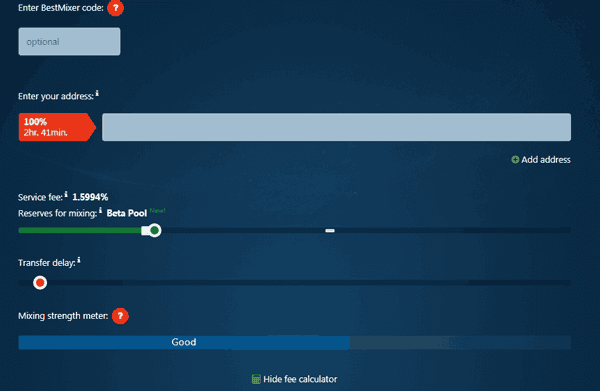 The Alpha Pool is what most Bitcoin mixers offer, the coins in this pool are from other users who deposited their coins for cleaning using the Alpha Pool. The Beta Pool on the other hand has coins from three sources, first from significantly bigger transactions in the Alpha pool, some coins from Investors in the company and then some from the company’s own reserves. This makes the Beta Pool a larger reserve than the Alpha and also gets users a more diverse source of coins to mix their coins with. Then finally the Gamma Pool is basically the Beta Pool minus the Alpha pool, meaning it too comprises of coins from investors and the platform’s private reserves, but no coins from other people who deposited their coins in the Alpha pool. This makes it the cleanest reserve among the pools even though it’s not as large as the Beta pool, so unless you need a fortune cleaned, and as long as security and anonymity is your priority this seems to be the best pool to go with. Users get to choose the pool at the mixing homepage using sliders which also alters the fee required for mixing. Now for one of the most important aspects of any mixer, its fee! The Fee on BestMixer depends on the pool you’ve selected as already mentioned. The minimum fee required to use the Alpha Pool is 0.5% which is at par with most other mixers in the industry, however, the minimum fee for the Beta pool is 1.50% while it’s 3% for the Gamma Pool. Note that these are only the minimum fee, while users may choose to pay a higher fee in order to increase their anonymity. The logs policy indicates what information is stored on the server regarding the client/transaction, and for how long. BestMixer stores “all conditions” of a transaction, meaning the output addresses, time-delays, percentage distribution and everything else till the order is completed in full successfully and then deletes all logs permanently after 24 hours of order completion. How many Confirmations are Required and What are the Minimum/Maximum Limits? 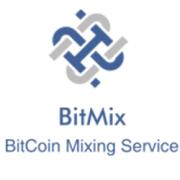 BestMixer.io requires anywhere between 1-6 confirmations for the coins to be cleaned and the exact number varies depending on the amount that’s sent in to be cleaned. As far as the minimum limit goes it’s set at 0.001BTC for Bitcoin and the maximum limit isn’t clearly specified and depends on the platform’s Bitcoin reserves at the time of mixing. Although considering that they’ve got three separate pools and sources for funds I’d take a wild guess and say they’re good for most amounts most of us would ever need cleaned. Does it Provide Mixing Code and Letter of Guarantee? It does provide the Mixing code which is an unique code generated for each cleaning operation, users may use it to identify themselves on the platform in future so that their older coins aren’t sent out to them as clean coins in the newer transactions. The platform also provides a “Letter of Guarantee” which is like a bond which verifies and states that the address generated for deposits is indeed generated by the platform, and as long as you’ve Blockchain to prove your deposits the platform can never deny not getting the funds. Both the features go towards making the platform more anonymous and secure and are reasons why I’d rate the platform a 5/5 in this BestMixer.io review. So that’s me signing off folks. To sum it all up, the platform doesn’t need any kind of registration, provides Mixing code, doesn’t store logs and provides for an easy interface. All these add up to make it one of the easiest to use, most anonymous and privacy-respecting Bitcoin mixers in the industry. Although note that it mixes a lot more than just Bitcoins including LTC, BTCH, ETH etc. although we kept ourselves limited to Bitcoins considering how this is a Bitcoin mixer review. There aren’t any features which I believe should be there but are missing; if you feel so let us know. Also, do drop your opinions, comments, feedback and queries about the platform as well as this Bestmixer.io review in the comments down there. 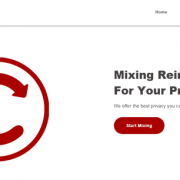 Chipmixer Review – Is it Legit or Scam?